One of the pivotal studies in developing network theory is Mark Granovetter’s 1973 essay ‘The Strength of Weak Ties’, which posits the hypothesis that weak ties are more beneficial to an individual seeking employment than strong ties. This is in part because ‘those to whom we are weakly tied are more likely to move in circles different from our own and thus will have access to information different from that which we receive.’ The weak tie acts as a bridge, connecting two individuals previously unknown to each other through a mutual friend or acquaintance. Using Granovetter’s example, if you select any two people at random, call them A and B, from a set of all the people who have ties to either or both of them, the stronger the tie between A and B, the larger the proportion of people in the set who will have ties to both of them. If the tie between A and B is weak, then they are less likely to have a significant amount of mutual links. If you add a third person to this example, C, who has a tie to A but not to B, the common ties between A and B and A and C will eventually bring B and C into contact, and a relationship will be generated. A acts as the bridge, and thus a weak tie is established between B and C.
In reading a series of letter’s written by Cicero for another purpose, it suddenly occurred to me that this concept might be applicable to the ancient world. Of the roughly thousand or so letters (plus fragments) written by Cicero that survive antiquity, about ten percent (of what I have surveyed thus far – I’m only about half way through the entire corpus of evidence) are litterae commendaticiae. These letters are written on behalf of a number of individuals (and on a few occasions, a municipium or other group), and sent to one of Cicero’s acquaintances in order to pave the way for the recommendee’s interests to be advanced. In essence, Cicero is recommending these men for a job, and is thus acting as the bridge, creating a weak tie between someone who requires assistance, and someone else who is in the position to grant such favour. The letters are scattered throughout his collections, but Book 13 (in the pre-Shackleton Bailey edition) contains 79 letters, 78 of which are ‘commendatory’ letters regarding individuals or communities, and as such is the largest concentration of this form found in the literature of antiquity. (By contrast, similar letters found in the works of Pliny the Younger and Fronto are distributed fairly evenly throughout their books). The fact that so many letters are concentrated in one book has led some scholars to view Book 13 as a collection that was compiled and published by Cicero in his lifetime, thus illustrating that Cicero regarded these letters as a definite ‘type’. Whilst this idea cannot be proved, the fact that the letters contain certain features suggest there was a schema or formula to the letters, that this form of writing was an entrenched practice, using set phrases and conventional attitudes. As nearly half of the recommendations found in Book 13 can be dated to 46 BC, this lends further weight to the idea that this book was specifically compiled. 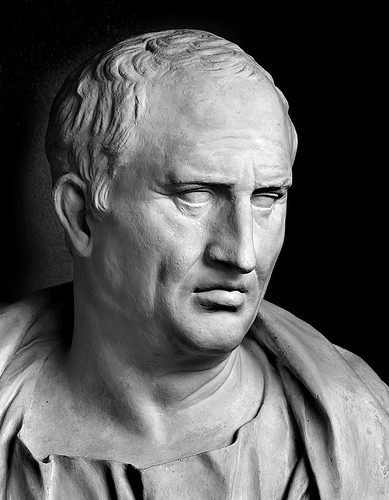 It seems as if 46 was a particularly good year for Cicero – he had found favour with Caesar upon his return to Italy, was happily into his second marriage, and hadn’t yet been devastated by the death of his daughter Tullia. Because of his past legal and political career, he was seen as having great influence despite a current lack of power, and was probably one of the most widely known figures in the Roman world besides Caesar. Publishing his litterae commendaticiae from this time would thus serve to heighten appreciation of the influence he was still able to wield through social contacts and networks. Letter writing in the Roman world was an essential part of political and social life, and that aspect goes some way to explain the nature of the letters of recommendation. Letters were meant to sustain or advance friendship and in the case of recommendations, were ineffective if there was no friendship between the author and addressee. Unlike more modern letters of recommendation, the emphasis in the letters of antiquity is not on the candidate himself, apart from identification, but the letter gets its force from the relationship between the recommender and the recipient. The letter was meant to invoke the obligations and responsibilities to each other which were born on an appeal to qualities of humanitas, liberalitas, voluntas, integritas, mansuetudo, clementia, stadium, and officium. Cicero not only makes note of his respect for the protocols of this obligation but also requests the benefactor to be aware of his deed, which illustrates Cicero’s desire to be seen as influential. These letters were more of a testimonial, recommending someone’s character, trustworthiness, honour, and staking the writer’s own reputation and integrity, as he provided surety for the recommended simply by writing the letter. In a compelling essay, which at its essence is about social networks though the term is never utilised, Roger Rees refers to this as ‘The Amicitia Triangle,’ a moniker which evokes the earlier example of the links between individuals A, B and C that bridged a tie between the two figures unknown to each other. He argues, I think correctly, that a ‘more persuasive argument than the bald assertion of the relationship between the author and the subject, or between the author and the recipient, was the integration of all three parties.’ This ‘social triangulation’ makes fulfilling the request for assistance that much more attractive to the addressee, because rejecting it would not only refute Cicero’s amicitia but also deny the possibility of a new relationship. The assertion that the subject, by definition a friend of the author (whether or not this is in fact true), will prove to be deserving of the friendship of the recipient, creates a contract of reciprocal obligations, which forms the basis of social system found in the Roman world. In his 1929 Loeb translation of the letters, Williams suggests that the recommendations Cicero wrote show ‘impressive evidence of Cicero’s large-hearted bonhomie, and his unfailing readiness to do a friend, or even an acquaintance, a good turn; in short, of that humanitas which was one of his dominant characteristics.’ I’d argue this gives Cicero considerably more credit than is his due, as the letters are more often about the author than the beneficiary, and the sheer number of letters of this type that survive antiquity, by others in addition to Cicero, demonstrates that this was a standard, if not expected practice, and was an integral part of the patronage system and necessary to ensuring one’s rise up the political ladder. This is particularly clear in a substantial series of letters Cicero writes to a young protégé, Gaius Trebatius Testa. Fortunately, we also have one letter Cicero wrote to Caesar, so we know that the claim of his efforts on Trebatius’ behalf was true. In this letter, Cicero breaks from form, referencing positions to which Trebatius no doubt aspires, but he does so in a joking manner. I suspect the tone is meant to prevent Caesar taking any offense that Cicero should presume to tell him what to do. There is further analysis to conduct with those letters I have catalogued so far, particularly in regards to the identity and connections between Cicero, the recommended individual, and the addressee of the letters. Deniaux’s prosopography of the letters should be particularly useful for this. From there, my intention is to go forward with the remainder of Cicero’s letters. I am most curious to see if he included recommendations in the correspondence he wrote to those we can undoubtedly view as Ciceros’s strongest ties – Atticus, Quintus, and to some extent, Brutus. Though the evidence certainly will never provide a completed network for any of the authors, the ability to build even a partial network for them should shed some light on how networks of patronage and advancement worked in the Roman world. Next week, on the 8th of October, I will be returning to my alma mater, the Department of Classics at the University of Reading, to kick off their Autumn Term seminar series. I am leaving Pompeii behind for the moment, and instead focusing on networks that are evident in the epistolary works of antiquity, specifically Cicero’s letters. He often wrote letters of recommendation for those seeking a position, and these letters can be used, in conjunction with Mark Granovetter’s landmark essay ‘The Strength of Weak Ties’, to examine the types of networks in play in ancient Italian politics and how strongly connected these networks were. Anyone interested in attending can find more information here. Otherwise, look for some version of my paper to be posted on this blog in a few weeks. A recent article in Smithsonian Magazine profiled the work of Caroline Winterer, an historian and director of the Humanities Center at Stanford University. She, like me, is using social network analysis to look at the past in a new way. In conjunction with the Center for Spatial and Textual Analysis, she leads a team taking a quantitative approach to the letters written by and to Benjamin Franklin as part of the project Mapping the Republic of Letters. This project, in which the research focuses more on the information typically found on an envelope than the content of the letter itself, demonstrates how this methodology allows historians, of any period, to discern connections and patterns found in huge amounts of often fragmentary data that would otherwise be inconceivable. Letters, unfortunately, do not survive from the ancient world in quite the same way, nor in such abundance – Franklin exchanged more than three thousand letters whilst living abroad between 1757 and 1775. For the best known letter writers of the ancient world, Cicero and Pliny the Younger, both of whom maintained collections of their correspondence specifically for the purpose of publication, there are merely hundreds. Survival of letters of the more average Roman, such as those recovered from Vindolanda, are more rare, especially outside of the dry conditions that preserve so much papyri in Egypt. To date, none have been recovered from Pompeii. Yet, amongst the thousands of graffiti that cover the walls of the city, there are exchanges between two or more scribblers, responding, commenting, and furthering a type of discourse that can, in some sense, be compared to the back and forth nature of more formal correspondence. One such example is a brief dialogue between men named Severus and Successus, rivals for the affections of a woman named Iris. Found at the entrance of a caupona at I.x.2, CIL IV 8259 and 8258 are actually three separate inscriptions, the first and last by Severus, with a reply from Successus in between. Non curat, sed ille rogat, illa com(m)iseretur. Et qui est homo pravessimus et bellus. Both Cooley & Cooley and Varone discuss the texts, noting that this sort of rivalry is not unusual in the Pompeian corpus of graffiti. There are numerous texts which disparage a love rival, insult an acquaintance, or dismiss the abilities (usually sexual in nature) of a fellow Pompeian. What fascinates me about this particular example is the exchange between the two men – and like Franklin’s letters – it isn’t the content I am interested in, but that it occurred at all. This dialogue illustrates the connectedness of this community – that Successus should not only discover and respond to the initial text, but also that Severus should come back to add further to their exchange. A likely scenario is that this pub served as the local drinking establishment for both men, with the popular Iris serving the wine. Regardless, this type of discourse, scratched onto a wall in Pompeii, provides evidence for a kind of interaction more usually found in letters, and thus substitutes one written form for another in a place where little non-lapidary writing survives. * With thanks to my dad, an avid magazine reader, who gave me the article that inspired this post.